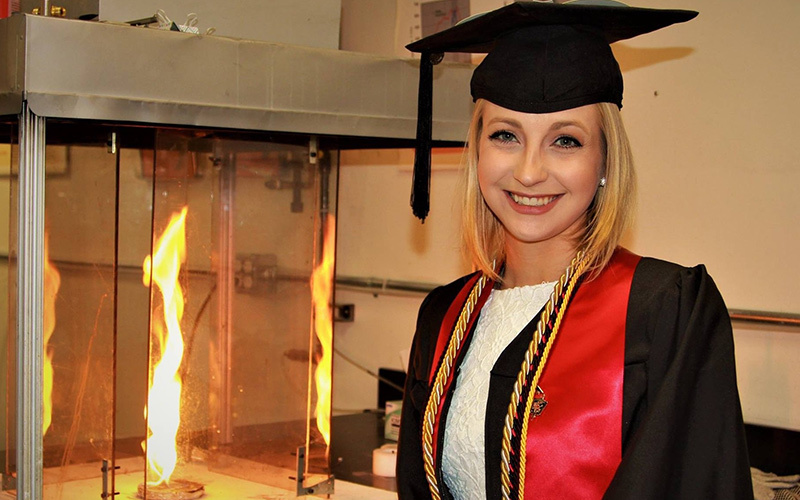 The Department of Fire Protection Engineering (FPE) at the University of Maryland offers an environment for advanced graduate study and research in the broad field of fire safety. FPE offers a Master of Science (M.S.) on campus. The program requires successful completion of eight (8) approved courses (24 credits), plus six (6) credits of thesis research (30 credits total). FPE also offers a Master of Engineering (M.Eng.) in Fire Protection Engineering through the Office of Advanced Engineering Education's Professional Masters program, both on campus and online. The program requires successful completion of ten (10) approved courses (30 credits total). A thesis is not required. Students enrolled in the Department of Fire Protection Engineering's (FPE) B.S. program may apply to our Combined Bachelor of Science / Master of Science program. This requires a GPA of 3.50 or higher and 90 or more degree credits. The Combined Bachelor of Science (B.S.) / Master of Science (M.S.) program allows students to complete both degrees in approximately five to five and a half years. The Department offers a Graduate Certificate in Fire Protection Engineering through the Office of Advanced Engineering Education, both on campus and online. The program requires completion of four (4) approved courses (12 credits total). FPE does not confer a Ph.D. degree at this time; however, students may pursue a Ph.D. with a strong emphasis on fire protection engineering by enrolling in the doctoral programs of other departments in the A.James Clark School of Engineering, such as Mechanical, Aerospace or Civil Engineering. Fire Protection Engineering faculty are affiliated with these departments and can serve as Ph.D. advisors. Students must fulfill the requirements of the department in which they are enrolled.